Last week, I published an article on Red Hat Developers Blog about MicroProfile Config and Health Check. It describes the two specifications with a simple MicroProfile application that uses both. The article also describes how to leverage them when the MicroProfile application is deployed on OpenShift (or any container platform based on Kubernetes). 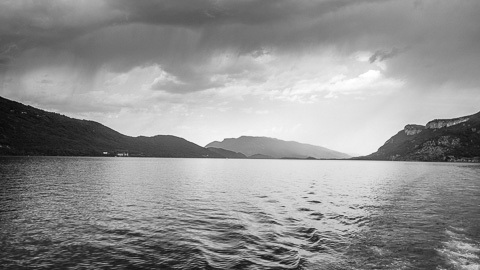 Yesterday, we made a 3-hour cruise on the Lac du Bourget and the storm was coming right before we left the boat. Eclipse MicroProfile Config 1.0 has been released. The developer no longer needs to check for configuration files, System properties, etc. He or she just specifies the name of the configuration property (and an optional default value). The Eclipse MicroProfile Config specification ensures that several sources will be queried in a consistent order to find the most relevant value for the property. With Eclipse MicroProfile Config 1.0 API available, I have released wildfly-microprofile-config 1.0.1. This implementation passes the MicroProfile Config 1.0 TCK. It can be used by any CDI-aware container/server (i.e. that are able to load CDI extensions). It is planned that this org.wildfly.swarm:microprofile-config Fraction will eventually move to Swarm own Git repository so that it Swarm will be able to autodetect applications using the Config API and load the dependency automatically. But, for the time being, the dependency must be added explicitely. If you have any issues or enhancements you want to propose for the WildFly MicroProfile Config implementation, do not hesitate to open issues or propose contributions for it. I recently looked at the Eclipse MicroProfile Healthcheck API to investigate its support in WildFly. WildFly Swarm is providing the sample implementation so I am very interested to make sure that WildFly and Swarm can both benefit from this specification. The Eclipse MicroProfile Healthcheck is a specification to determine the healthiness of an application. It defines a HealthCheckProcedure interface that can be implemented by an application developer. It contains a single method that returns a HealthStatus: either UP or DOWN (plus some optional metadata relevant to the health check). Typically, an application would provide one or more health check procedures to check healthiness of its parts. The overall healthiness of the application is then determined by the aggregation of all the procedures provided by the application. If any procedure is DOWN, the overall outcome is DOWN. Else the application is considered as UP. The specification has a companion document that specifies an HTTP endpoint and JSON format to check the healthiness of an application. Using the HTTP endpoint, a container can ask the application whether it is healthy. If it is not healthy, the container can take actions to deal with it. It can decide to stop the application and eventually respin a new instance. The canonical example is Kubernetes that can configure a liveness probe to check this HTTP health URL (OpenShift also exposes this liveness probe). This HTTP endpoint can be used to configure OpenShift/Kubernetes liveness probe. Any deployment that defines Health Check Procedures will have them registered to determine the overall healthiness of the process. The prototype has a simple example of a Web app that adds a health check procedure that randomly returns DOWN (which is not very useful ;). These procedures are relevant regardless of the type of applications deployed on the server. // status is is down is used memory is greater than 90% of max memory. To better integrate WildFly with Cloud containers such as OpenShift (or Docker/Kunernetes), it should provide a way to let the container checks the healthiness of WildFly. The Healthcheck specification is a good candidate to provide such feature. It is worth exploring how we could leverage it for user deployments and also for WildFly internals (when that makes sense). This is another post that covers some work I have been doing around the Eclipse MicroProfile Config as a part of my job working on WildFly and Swarm (first post is here). This post is about some updates of the project status and work being done to leverage the Config API in OpenShift (or other Docker/Kubernetes-based environment). Since last post, WildFly and Swarm projects agreed to host the initial work I did in their GitHub projects and the Maven coordinates have been changed to reflect this. For the time being, everything is hosted at wildfly-extras/wildfly-microprofile-config. The Eclipse MicroProfile Config 1.0 API should be released soon. Once it is released, we can then release the 1.0 version of the WildFly implementation and subsystem. The Swarm fraction will be moved to the Swarm own Git repo and will be available with future Swarm releases. We have added a new type of ConfigSource, DirConfigSource, that takes a File as a parameter. When this ConfigSource is created, it scans the file (if that is a directory) and creates a property for each file in the directory. The key of the property is the name of the file and its value is the content of the file. There are different ways to use the corresponding DirConfigSource depending on the type of applications. If you are using the WildFly implementation of the Config API outside of WildFly or Swarm, you can add it to a custom-made Config using the Eclipse MicroProfile ConfigBuilder API. What is the use case for this new type of ConfigSource? It maps to the concept of OpenShift/Kubernetes Config Maps so that an application that uses the Eclipse MicroProfile Config API can be deployed in a container and used its config maps as a source of its configuration. I have added an OpenShift example that shows a simple Java application running in a variety of deployment and configuration use cases. This highlights the benefit of using the Eclipse MicroProfile Config API to configure a Java application: the application code remains simple and use the injected values from the Config API. The implementation then figures out all the sources where the values can come from (System properties, properties files, environment, and container config maps) and inject the appropriate ones. This is the first post that will cover some work I have been doing around the Eclipse MicroProfile Config as a part of my job working on WildFly and Swarm. In this post, I will show how to use the Config API from a Java application. The remaining posts will be about developing such new features within the WildFly and Swarm ecosystem. An open forum to optimize Enterprise Java for a microservices architecture by innovating across multiple implementations and collaborating on common areas of interest with a goal of standardization. There is really not much to the Config API. It is a simple API that hides all the complexity of gathering configuration from various places so that the application can focus on using the values. One important feature of the API is that you can define the importance of the config sources. If a property is defined in many sources, the value from the config source with the higher importance will be used. This allows to have for example default values in the code or in a properties file (with low importance) that are used when the application is tested locally. When the application is deployed in a container, environment variables defined by the container will have higher importance and be used instead of the default ones. The code above comes from the example that I wrote as a part of my work on the Config API. I have not yet released a version of my implementation as it is not clear yet where it will actually be hosted (and which Maven coordinates will be used). 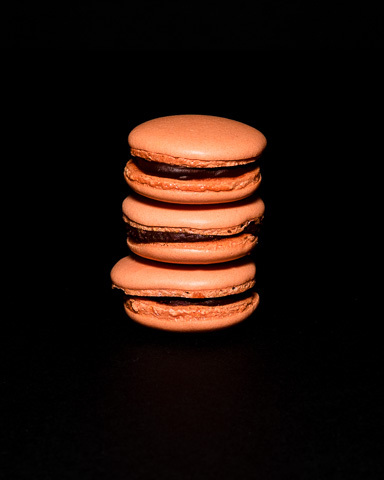 This first post is a gentle introduction to the Config API. The specification is not final and I have left outside some nice features (such as converters) that I will cover later. The next post will be about my experience of writing an implementation of this API and the way to make it available to Java EE applications deployed in the WildFly application server or to MicroServices built with WildFly Swarm. This web site is composed of static files generated by Awestruct. I have extended the basic Awestruct project to provide some additional features (link posts, article templates, photo thumbnails, etc.) Unfortunately, some of these extensions uses Rubygems that depends on native libraries or uglier spaghetti dependencies. I recently wanted to write an article but was unable to generate the web site because some Rubygems where no longer working with native libraries on my Mac. Using bundler to keep the gems relative to this project does not solve the issue of the native libraries that are upgraded either the OS or package system (such as Homebrew). This was the perfect opportunity to play with Docker to create an image that I could use to generate the web site independantly of my OS. I create this jmesnil/jmesnil.net image by starting from the vanilla awestruct image created by my colleague, Marek. I tweaked it because he was only installing the Awestruct gem from the Dockerfile while I have a lot of other gems to install for my extensions. I prefer to keep the gems listed in the Gemfile so that the project can also work outside of Docker so I added the Gemfile in the Dockerfile before calling bundle install. Once the Docker image is started by this script, I can then use regular Rake tasks to run a local Web server to write articles (rake dev) or publish to Amazon S3 (rake production). This is a bit overkill to use a 1.144 GB Docker image to generate a 6MB web site (that only contains text, all the photos are stored in a different S3 bucket) but it is worthwhile as it will no longer be broken every time I upgrade the OS or Brew. The image is generic enough that it could serve as the basis of any Ruby project using Bundler (as long as required native libs are added to the yum install at the beginning of the Dockerfile). This is a great review of the iPhone 6s camera and summary of its new features. Marion has bought an iPhone 6s and the camera is a definite improvement when I compare her photos to the ones from my iPhone 6. 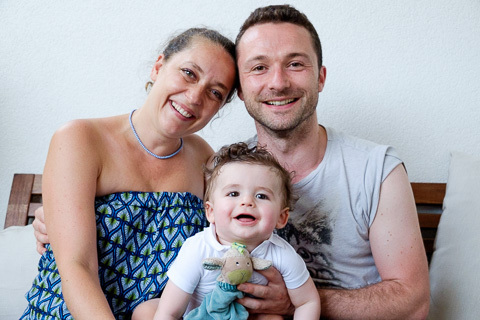 Our first child, Raphaël, is born last September and we will soon celebrate his first birthday. This year has been the happiest of my life. However, having a baby means that I have less free time than before, and I want to spend this time with my family or doing personal projects I feel passionate about. These days I feel more passionate about making photography (mostly of Raphaël and Marion) than writing software (I already have a full time job at Red Hat where I enjoy coding on WildFly). Before our baby's birth, I could spend evenings and weekends working on personal Open Source projects. After one year, it is time to admit that I do not want to that anymore and act accordingly. I'll modify these projects READMEs to warn that they are no longer maintained (with a link to that post to give some context). It's not fair to users to spend time using them, reporting bugs and have no warning that their issues will be ignored. If you are using these projects, I understand that you may be upset that your bugs are not fixed or that the enhancement you request will not be fixed in the original project. Fortunately, these projects are licensed under the Apache License V2. 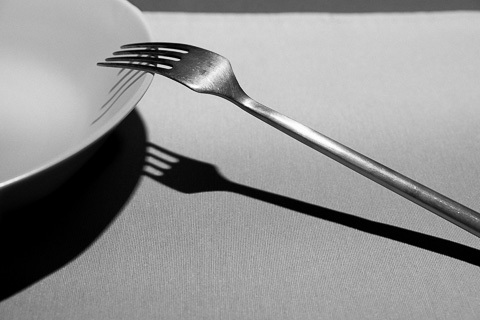 You can fork them (they are hosted on GitHub and use Git as their version control system) and modify them to suit your needs. I also had some discussion to donate stomp.js to Apache ActiveMQ. It is a tough decision to not maintain these projects anymore but it is a decision that I have subconsciously made months ago. Now I just have to acknowledge it. I may revisit this decision when my child is older or when I feel passionate about these project again. Or I may create other Open Source projects, who knows? The key thing is that by releasing these projects under an Open Source license, I ensured that their use could outlast my initial contributions to it. 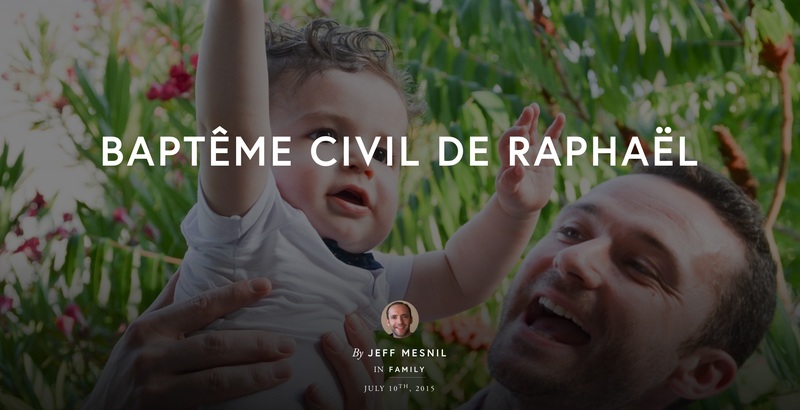 Earlier this month, we celebrated the civilian sponsorship1 of our son, Raphaël. It was a great sunny day full of laughs and emotion. Now our son has a godfather and godmother that will be there to take care of him. I took this opportunity to create a story on Exposure. I learnt about this service from Scott Kelby and this celebration was a good candidate to try this service. You can read the story (in French) here. Exposure service is really good (I only used their free offer). The image layout options are basic but good enough for such an image-oriented story. There is only one place where I would have preferred to use a grid layout with same size for all images. I also would have liked more typography options to better distinguish the (sparse) text. Scott Kelby's page provides some great examples of Exposure features. I don't plan to upgrade to their pro offer but I'll keep playing with it as their offer improves. 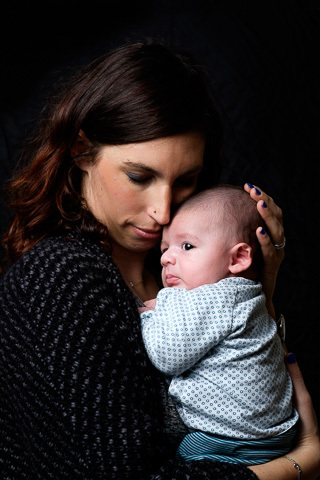 Over the week-end I experimented with portraits of Marion holding our baby, Raphaël. I wanted to go for an intimate moment between a mother and her baby. The idea was to have a soft portrait of Raphaël and Marion wrapped in shadows. Regardless of the darkness that surrounds them, their love is a bright light that will not be dimmed. The end result looks like a chiaroscuro painting of La Vierge à l'Enfant. Technically, this is a simple photo with a soft light to preserve this private moment. I used a one-light setup with a Yongnuo YN-560 III flash reflected by a 34" white umbrella. I positioned the flash at their right, at 45° above them. The light is feathered so they only catch the edge of the light (retrospectively, I should have feathered it even more to increase the intimacy). The background is a 40"x60" reflector with its black surface. Since the light is feathered, almost none reaches the black background and it remains pure black. I used my Fuji X-E2 with its awesome 56mm ƒ/1.2 lens that I opened at ƒ/5.6 to have enough field of depth for both of them. Raphaë was intrigued by the flash tests and I just had to make a few pictures to capture this one. Simple stuff, and a lovely moment that all three of us shared. Last week, I made a webcast for O'Reilly about using messaging protocols to build mobile and web applications to promote my book, Mobile & Web Messaging. This webcast can be watched for free and you can also read the slides I used for the presentation. They contain most of the information I talked about during this 1-hour long webcast. Thanks to the people at O'Reilly (and especially Yasmina Greco) to setup this presentation, it was a great and fun experience. Our first child, Raphaël Mesnil, is born on September, 28th at 52cm and 3.230kg. Marion and the baby are fine and we enjoy every moment with him. I am already making good use of the Fujinon 56mm ƒ/1.2 lens that I bought a few months ago when we learnt that Marion was pregnant. 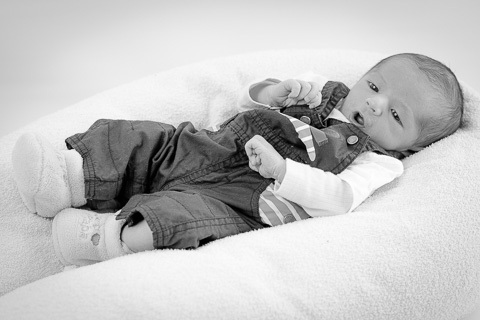 I am not accustomed to baby photography (or portraits in general) but this will change now that Raphaël is here. We were back at home for one day and I was already setting up a studio to shoot his portrait. Next step is to make photographs of Marion and the baby together. So much fun, so much love. We went to Venezia last May and had a rainy day during our trip. We spent almost the whole afternoon at a coffee shop and I was shooting the soaked people rushing to cross the street. 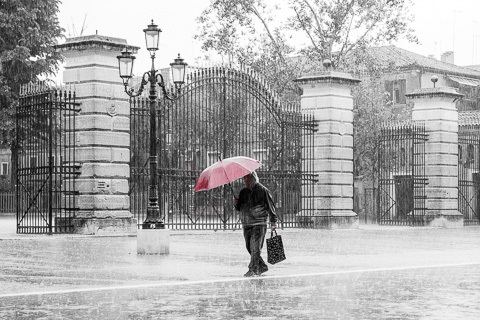 This old man stood out with his red umbrella and his leisurely pace. For the past 18 months, I have photographed bottles of beer for my friends of Une Petite Mousse. On their web site, you subscribe to receive every month a box of six bottle of beers. The selection changes every month and contains a mix of well-known beers and others from micro-breweries. 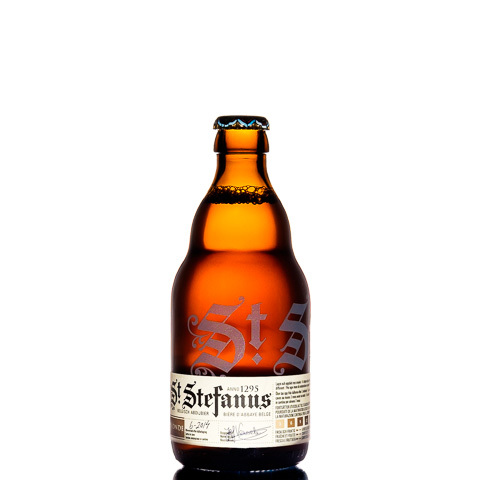 It is a great way to discover and taste new beers that you can not find in a store near you. They need pictures of the bottles for their online catalogue and the paper guide that comes in the boxes. 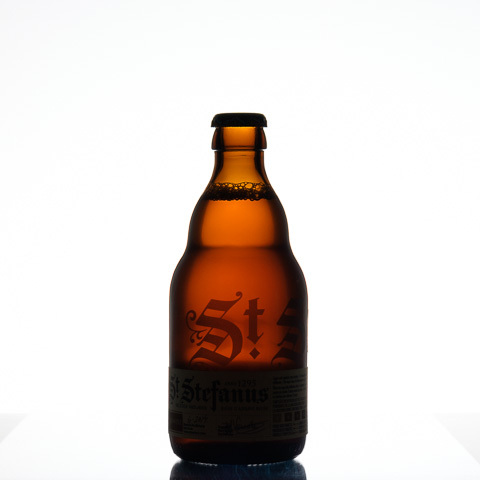 Making photographs of a bottle of beer is suprisingly challenging. I want to give on overview of the color of the beer inside the bottle (which are often made of a dark glass) while highlighting the label on the front of the bottle. In order to build the catalogue, I want to have an uniform style for all pictures with a pure white background and a square format (to keep the respective size of the bottles). In this post, I'll explain the process I have used for the latest box (available mid-september). For september 2014, one of the beers is the St. Stefanus Blonde, brewed in Belgium. The picture above is from their web site (I really like how the strips of white emphasize the roundness of the small bottle). Before explaining my process, I heartily recommend to read Light Science and Magic: An Introduction to Photographic Lighting . This book is an invaluable help to understand how light plays with shapes and textures. 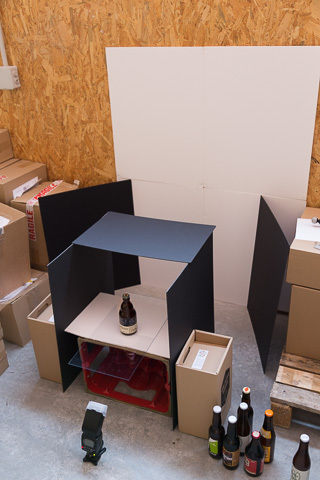 The first step is to place the bottle and the various white and black foam boards that will give the bottle a distinctive shape. In order to highlight the color of the beer inside the bottle, I will light white foam boards in the background. 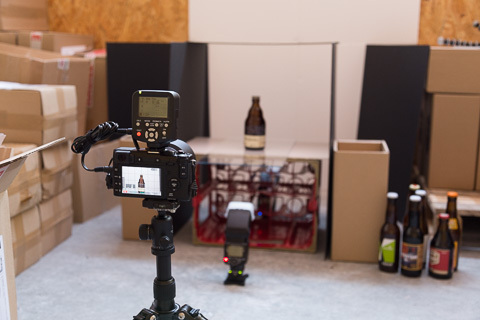 The light will bounce on the boards and go through the bottle before reaching the camera. The background will be overexposed to be pure white. I also want to have well-defined edges on the bottle. I place two black foam boards on each side of the white background. These black boards will appear on the edges of the bottle and increase the contrast and sharpness of its shape. Without these black boards, the light coming from the white background would splill on the edges and make them too soft. I put the bottle on a white foam board (with a plexiglass to have a small reflection at the bottom). Finally, I put other black foam boards on each side of the bottle and on top of it to prevent any leaking light to reach it. I then place the camera at the right distance of the bottle to have it fill the image height. The image will be cropped to square in post-processing. I activate the X-E2 guides on its screen to have a good overview of the final size. Once the camera is correctly placed, I fine tune the placement of the black boards on each side of the white background. They must be placed so that the edges of the bottle are dark but not too close so that they fill the inside of the bottle. I put the bottle on top of a small box to be able to place the flashes below it (so that they do not appear on the photos) and angle them appropriately to light the scene. I want to control the lighting and block any ambient light (the garage where I took the photos has lights coming from windows that can not be easily blocked). 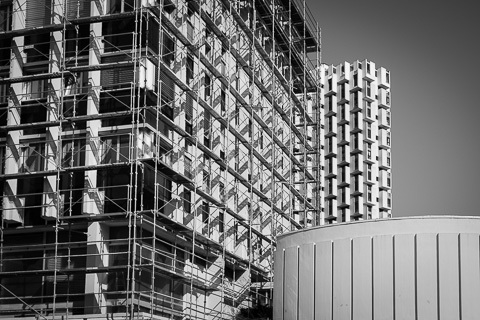 I configure my camera to 1/180 (the highest sync speed for the X-E2) and ISO 400. The lens is stopped down to ƒ/8 to have enough depth of field. With these settings, the image is so dark that I know I will not be bothered by any ambient light (the photo is cropped but no other postprocessing has been applied). Next step is to place the two flashes and provide the lighting. The main light is provided by the flash behind the bottle. It is directed towards the white background and will light the bottle after bouncing on the background. 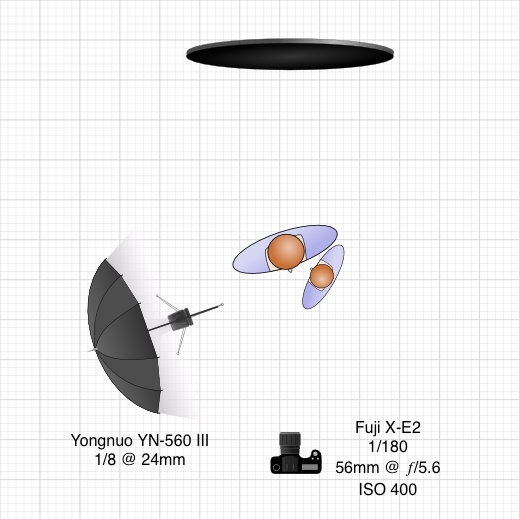 I use the Yongnuo YN560-III zoomed at 24 mm with a diffuser to spread the light on the white background. When I take the picture, I can see that the beer inside the bottle is well lit and the background is overexposed to pure white. Thanks to the black foam boards, the edges of the bottle are dark and sharp enough (the photo below is cropped but no other postprocessing has been applied). The liquid inside the bottle is lit but there is no light reaching the label on the front of the bottle. I then to use the second flash (Nikon SB-700) to light only the label. The placement of the flash is tricky because it can easily create highlights on the glass if it is not properly directed. I place it below the bottle with an angle of 45° or so. 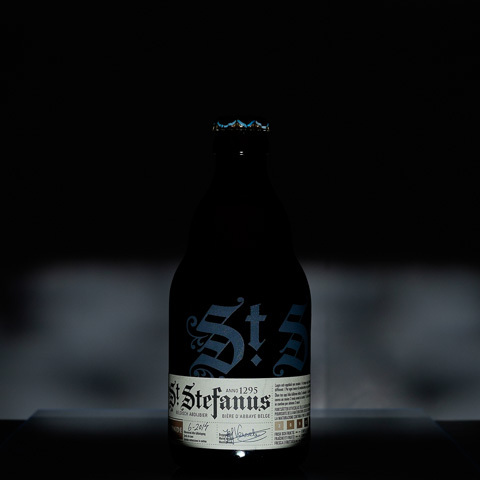 It is fully zoomed at 135 mm to focus its light on the label. With this angle and zoom, the flash will lit the paper label but most of the light reaching glass will not be captured by the camera.  The photo below shows the bottle lit by the front flash only (the photo below is cropped but no other postprocessing has been applied). We can see there are two highlights on the bottom of the bottle and near its neck. They are small enough that I will be able to remove it in post processing. When I take the picture with both the back and front lights, I capture the final (cropped but unprocessed) picture below. Most of the work is now done and I just need a few touches of post-processing to finalize the image. I use Lightroom for the image post-processing. Once the image is imported, I correct the lens distorsions and crop the image to a square format. I also increase the sharpness in the Details module (+52 Sharpening). The numbers are meaningless. They are different for each bottle, depending mainly on the color and texture of the liquid and glass. The goal with any of these settings is to have a pure white background and a bottle that is well exposed and contrasted. I use the Spot Removal tool to remove the highlights caused by the front flash at the bottom of the bottle and near its neck. I finally export it in JPEG and hand it over to Barbara, the graphist designer of Une Petite Mousse, that uses it for the paper guide and the web site. Since March 2013, I have photographed more than one hundred different beers1 and each one is a different challenge. The shape of the bottle changes, the color of the liquid and the glass change too. Some have dark labels, others have golden labels. Some do not have labels at all and the text is put directly on the glass. I am always tweaking and refining the process to capture all these subtle differences and I am sure that I will continue to do so for as long as I take pictures and enjoy it. 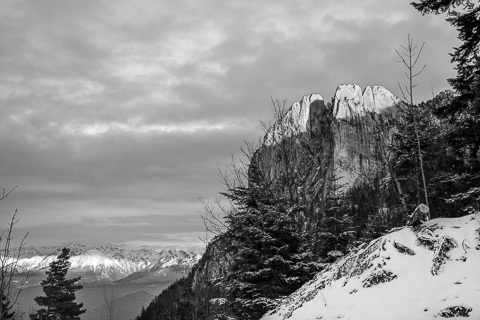 Les 3 Pucelles, the Three Maiden, are three rocks high above Grenoble in the Vercors. It was an important location used by the Resistance during the 2nd World War. 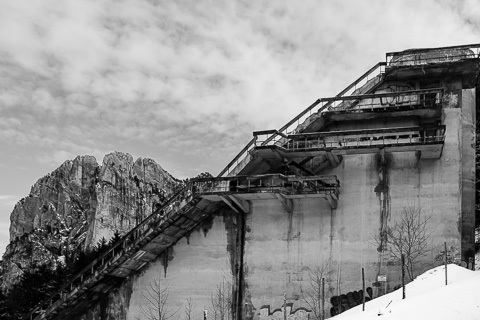 This 90-metre springboard was used for the ski jumping competion during the 1968 Winter Olympic Games at Grenoble. It has been closed since the 80s and can no longer be used. Yesterday, I was reading a book about André Kertész, one of my favourite photographers. I tried to reproduce one of his most famous photographs, La Fourchette, that he made in 1928. The printing I have is more subtle and nuanced that this picture from Wikimedia that has too much contrast. 2013 has ended and it's the opportunity to look back at all the photos I made during the year. I expect more of the same in 2014 and continue to improve my craft and skills.